You are looking at a2017-18 O-PEE-CHEE PLATINUM HOCKEY JAKUB VORACEK #43 RED PRISM PARALLEL CARD 093/199. JAKUB VORACEK GOLD PARALLEL. YOU ARE LOOKING AT A2010-11 ARTIFACTS. CARD NUMBER #96. To CANADA. 15/35 . YOU ARE LOOKING AT A2016-17 Upper Deck Premier Premier Duals Jersey #PD2VS Jakub Voracek/Wayne Simmonds 57/99 Card. CARD NUMBER #PD2-VS. To CANADA. YOU ARE LOOKING AT A 2014-15 ARTIFACTS JAKUB VORACEK RUBY PARALLELC ARD. CARD NUMBER #37. To CANADA. 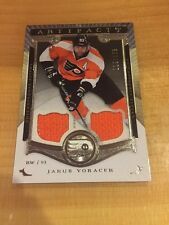 2016-17 Premier Jakub Voracek /399 Flyers!!! You are looking at a 2016-17 Premier #3 1 Jakub Voracek of the Philadelphia Flyers and is serial numbered 198/399! 2015-16 Upper Deck Exclusives /100 RYAN ELLIS, SETH JONES, JAKUB VORACEK......!! Player: Jakub Voracek. Set: 2013-14 Dominion. Team: Philadelphia Flyers. Sport: Hockey. Year: 2013. SetType: Main. Manufacturer: Panini Group. Attributes: Serial Numbered. YOU ARE LOOKING AT A 2016-17 UPPER DECK PREMIER JAKUB VORACEK BASE CA RD. CARD NUMBER #31. To CANADA. JAKUB VORACEK. 2010-2011 UPPER DECK SP AUTHENTIC SP ESSENTIALS SHORT PRINTED CARD. CARD IS NUMBER 154 AND IT IS NUMBERED. VO. 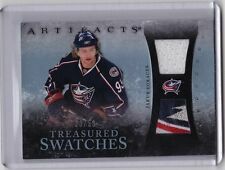 Jakub Voracek. . 2010-11 PANINI "PINNACLE" HOCKEY. "THREADS".